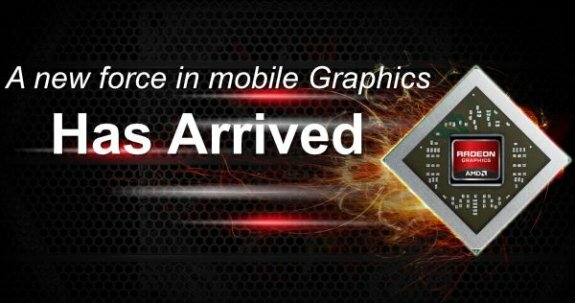 AMD introduces its mobile Radeon HD 7000M series graphics cards, it includes the Radeon HD 7900M, Radeon HD 7800M and Radeon HD 7700M. 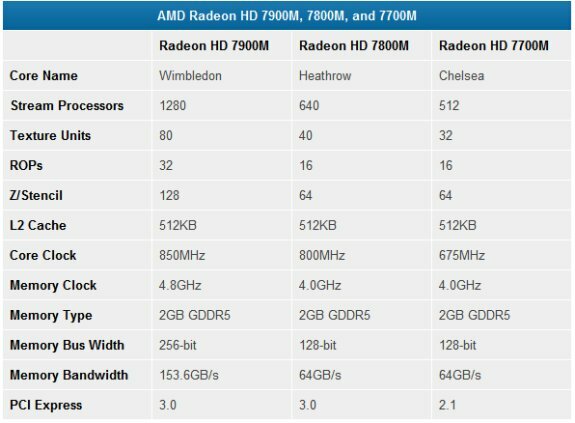 Starting at the high end, AMD will have the 7900M series. Note that there will be more than one part for each family, but AMD is currently providing the configuration for the highest performance parts in each category. At the top, the HD 7970M uses a fully enabled Pitcairn core. The GPU clock is 850MHz compared to 1000MHz (stock) on the desktop HD 7870, but surprisingly AMD is going whole hog on the RAM and featuring 2GB of 4.8GHz GDDR5. That makes the 96GB/s bandwidth of NVIDIA’s GTX 580M/675M positively pale in comparison, and we’d wager the GPU performance will easily reclaim the mobile performance crown—at least until NVIDIA launches the inevitable GTX 680M, but we don’t know when that will be. Going by the core clocks, the HD 7970M should be about 15% slower than the HD 7870, and given the fact that no consumer laptops have yet shipped with an LCD resolution above 1920x1200, you can look at our HD 7870 benchmarks and subtract 15% to get a pretty good idea of how the HD 7970M will perform.